The Security Benefit Association (formerly the Knights and Ladies of Security, a fraternal organization) built a model farm, hospital, orphanage and old folks' home on a hill west of Topeka, Kansas. These black and white photographs are from that time-- about 1918 to 1930. 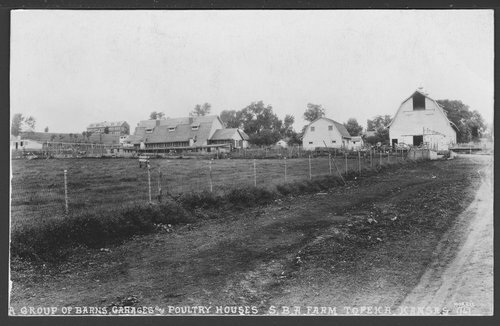 The model farm was known for its prize Holstein herd and poultry. Later, in about 1960, the Menninger Foundation purchased the property. In 1982, the "West Campus" was developed -- a residential community of 28 structures on the 350 acre hilltop campus. Most of the SBA buildings were converted to Menninger Clinic programs. Security Benefit Association farm and hospital complex in Topeka, Kansas - A postcard showing the group of barns, garages and poultry houses on the model S.B.A. (Security Benefit Association) farm. In the distance, to the left, the old folks' home can be seen. (later called the Neiswanger building).